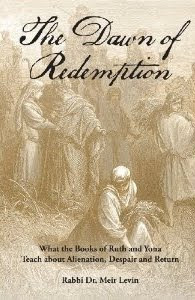 As I was preparing for Shavuos by reading Dr. Meir Levin's recently published study of Rus (and Yonah), in his The Dawn of Redemption: What the Books of Ruth and Yona Teach about Alienation, Despair, and Return, I was struck by his discussion of the first verse. One of the troubling aspects of the media -- newspapers, magazines, radio and blogs -- is the pitfall of continually focusing on the negative. When we constantly harp on the bad we run the risk of forgetting about the good. This can create a cynicism that undermines our attitudes towards everything in our lives. Legitimate criticism that is sober and constructive is valuable to the community but it has to be kept within context and perspective. Illegitimate criticism can be based on wrong information, an incorrect assumption of incompetence, the wrongful attribution of malice or other causes. It is this kind of corrosive cynicism that leads some to assume that the many good people who lead our communities are tainted by any of these evils. The Book of Ruth opens with a description of a time "when the judges judged." Such an introduction aims to explain something about the time in which the events described in the book took place and therefore provides important backgtound. [At the time after the division of the land by Joshua], the land became precious to them. One person busied himself with his field and another with his vineyard, still another with his doorpost.... They refrained from dealing kindness to Joshua [at his burial] and the Holy One, blessed be He, thought to shake up the entire world [i.e., became angry], as it is writren, "The earth as shaken up and disturbed" (Psalms 18). Woe to the generation that judges its judges! When the judge said: "Remove a splinter from between your teeth," the accused would say, "First remove the beam from between your own eyes" (Bava Batra 15b; see also Ruth Rabbah 5:10). This is a description of anarchy. Rather than say, "In those days there was no king in Israel; everyone did what was right in his own eyes" Oudges 21:24), which describes only the political situation, the Book of Ruth recounts it in a way that emphasizes its effect on individuals. It was a time perhaps similar to the time in which we ourselves live -- when people distrusted authority, avoided communal obligations, and held their private lives to be superior to and more valuable than public life. In those days, as in ours, the leaders' faults attracted far more attention than their virtues did. The Israelites were occupied, each with his own little plot of land and his own vineyard, jealously guarding the doorpost of his own private world from intruders. In such times, leaders are seen not as noble individuals who sacrifice selflessly for the common good, but rather as opportunists who are tainted by self-interest and personal, and therefore petty, needs. If our leaders cannot be trusted, neither can our neighbors. Cynicism is corrosive. In an atmosphere of mutual suspicion it becomes difficult to view others benevolently and to behave with kindness and charity. Since the people felt that they owed Joshua nothing, they neglected to pay him last respects. When there is no justice, there is also no sense of security, and everyone lives in fear and suspicion of their neighbors. Only this can explain how a prominent prince of the people, Elimelech, could abandon his community, including his extended family, at such a difficult time and go to another country where his material needs would be better met.